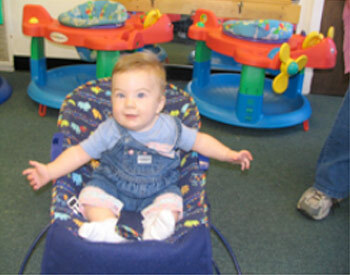 Little White House Learning Center is proud to provide a safe and secure environment for your infant to play and grow. Our infant teachers love babies and understand their individual needs. Because each infant is at a different stage their schedule is totally as unique as they are. Bottles, feedings, and naps are scheduled according to arrivals and demands. Diapers are changed on a two hour schedule unless warranted more frequently. Our teachers work with the babies on fine and gross motor skills as well as hand/eye coordination. Our infant room is structured so that children are provided with a separate sleep and play area. Children are encouraged to explore their environment. Age appropriate educational toys are provided to enhance and encourage curiosity and development. Parent/teacher communication is very important at our center. Informative daily sheets are provided for each child. These reflect activities during the day such as diaper changes, feedings and naps.